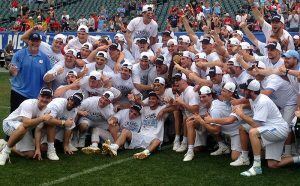 PHILADELPHIA, PA – Chris Cloutier scored in overtime to give North Carolina a 14-13 victory over Maryland in the men’s lacrosse championship game on Monday. The winning goal was Cloutier’s 14th over two games at Lincoln Financial Field. Dave Ryan and Mark Dixon had the call on Westwood One Sports.